As I mentioned in the first article in the IG Codex review series, I’ve heard quite a few people are interested in allying with the Imperial Guard and using the Primaris Psyker as the mandatory HQ in order to get access to the rest of the codex's goodies. This article is aimed both at them and at the many stalwart players who use IG as their primary army and are interested in how access to the new Psychic Tables has changed the only Psyker in their codex apart from the Psyker Battle Squad. First let’s have a look what you get for your money. The Imperial Guard Primaris Psyker is a model with Leadership 9, 5+/5++, Toughness 3 and 2 Wounds for 70pts. 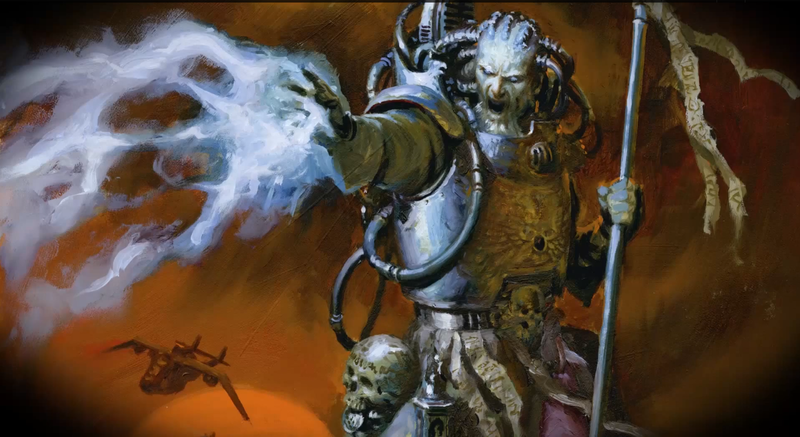 He comes with a laspistol and force weapon, but unlike many IC psykers has no upgrade or weapon options available. 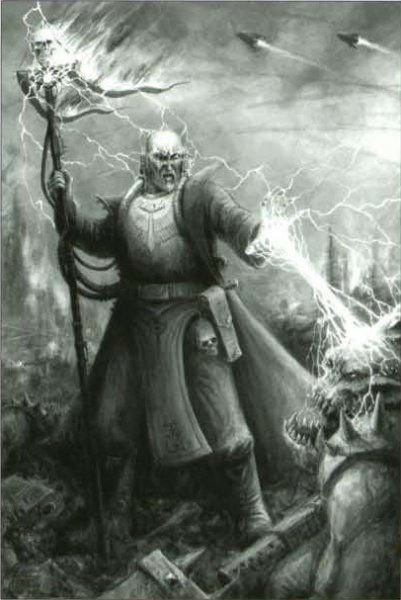 The Primaris Psyker has now become Mastery Level 1 with the chance to roll for 2 powers from the Biomancy, Pyromancy, Telepathy and Telekinesis Psychic Charts. 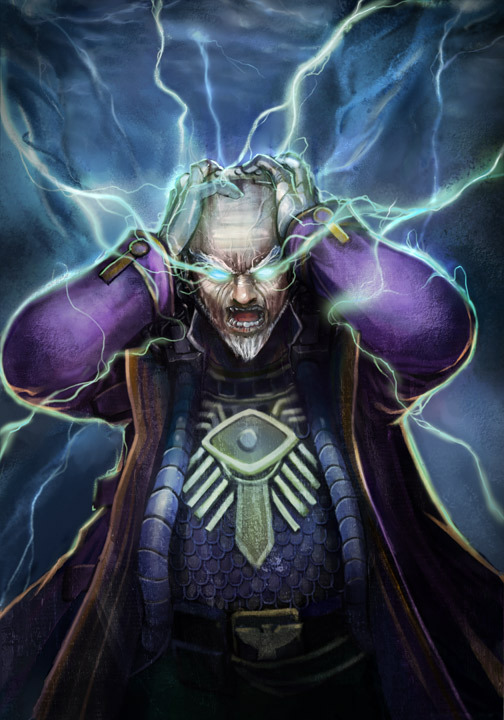 In a nutshell, neither of the Codex powers were good enough to justify his inclusion in competitive lists under the old rules, so the Primaris Psyker’s best chance in 6th Edition relies on his access to the new Psychic Chart. Now we're diving in deep the deep end to look at all 30 book powers. Witchfire - Rolls To Hit, or scatters if blast, or hits automatically if template. Focussed Witchfire - Pick out models in an enemy unit if your LD test is 5 or less test. Beam - fire in a line from Psyker and hit all under the line, strength reduced by 1 for every hit. Maelstrom - targets all units (friend or foe) in range, regardless of line of sight, being locked in combat, intervening models/terrain and so on. Nova - Automatically hits all enemy units within the maximum range, regardless of line of sight, being locked in combat, intervening models/terrain and so on. Short range terminator-tickler, combining excellent armour penetration with mediocre strength. Has to roll to hit (BS4) as well as pass Psychic Check, then pass Deny the Witch and then wounds on a 4. The short range doesn't suit Guard, limiting the value of this power. The best use would probably be accompanying a plasma squad into rapidfire range - but that just serves to highlight how much better off you would have been to buy more plasma guns with the same points. While this is tremendously appealing to a model like Mephiston, the Primaris Psyker is a Lover not a Fighter; this has very little use for a T3 5++ character. Take the Default power. Very useful; the range and effect of the power combine well for a shooting army, and some of our worst enemies (jumppacks, bikers) suffer most from difficult terrain. It reduces the instant death threshold for of high toughness models, making high strength shooting much more effective. If this was the Primaris power, I would take it by default and include a Psyker in every army. No, really. Definitely not as useful for Guard as some armies, but there is one build that could really benefit from it: the massed Infantry Blob. It will not Die is no help, but there is a huge appeal to FNP and Relentless to allow a guard unit of 40 or so men to rapidfire and then assault. The problem is you can’t build an army around a random power. It can also restore hull points, but doing so requires a psychic test and then a 5+ roll, making it a long shot unless you are running squadrons of vehicles in which case it becomes reasonable. Again, the problem is you can’t build an army around a random power. Short range terminator-killer. It has half the shots of Smite but at higher Strength; since the 'wound regain' aspect is not very useful on a T3 character you are often better off with the Default smite unless the psyker is with an anti-vehicle unit. Primaris Psykeris a Lover not a Fighter; this has very little use for a T3 5++ character. Take Default power. This power is very easy to over-rate. If you kill more than 3 models, you are probably using it on Gretchin. Conclusion: Don’t roll on the Biomancy table if you are Imperial Guard. The Imperial Guard do not get access to the Divination table, which is a shame because it has a primaris power that would be useful always in every army. I am including it because you can gain access to it through allies, but apologies to anyone who wants to run a pure Guard army and feels like an orphan looking through the sweet-shop (candystore) window. The beautiful love-child of the Guard order 'Bring it down' and Eldar’s Guide. Prescience allows re-rolling all failed rolls to hit and affects vehicles as well as infantry, works in close combat as well as shooting, and (unlike BID) doesn't require the enemy to be a vehicle or MC. Whether you run ordnance squadrons, heavy weapon teams or massed infantry units, this is without a doubt an excellent power. Psyker and unit has Counter Assault and shoot Overwatch at normal ballistic skill. An amazing ability if combined with a large squad of shooty troops liable to getting charged. ie, A Guard Blob Squad. Less impressive but still useful if the Psyker is in a vet squad with plasmaguns or similar. Does not allow your models to fire blast weapons, and the psyker must be in the charged squad. Target friendly unit has 4++ save. It's not a big step up from a cover save against shooting and T3 models will still die in combat, so probably best to take Prescience. IG Rating 4/10 - It would get a higher score if it is applied to allied assault units instead of Guard. One enemy unit re-rolls all successful saves. 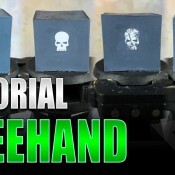 The range makes it combine well with a good round of shooting, making marines and terminators a lot more vulnerable. Guard’s long range firepower means our army can really take advantage of an enemy unit that has this cast on it. Psyker and units weapons ignore cover special rule. Cover being 5+ and ‘Focus Fire’ abilities make this less useful than it could have been, as does the fact that so many Guard weapons are blocked by armour instead of cover. However, there are times this will be useful, especially if the opponent has stealth. If not, take the primaris power Prescience. The Psyker can re-roll all failed to hit and wound rolls, as well as saves. This would get a very low rating if used on the Primaris Psyker, but having access to it means you are using an ally who may benefit more. It is unlikely to be a better choice than Prescience. Roll three dice and chose the result you want when rolling for reserves, Outflank and Mysterious terrain. Ignoring the Mysterious Terrain (since most tournament I’ve heard of don’t want to use it), this makes your Psyker into a super-Astropath. If you are playing IG as your main army and have lots of reserves you should have already bought an Astropath for a +1 to reserves and re-roll of outflank (admittedly not as good, but a lot more reliable). On the other hand, if you don’t have many reserves, this is not a very useful power. Conclusion: This is the Chart you wish you could roll on, because the worst case scenario is you get an amazing Prescience power. If you want it, get yourself a Rune Priest or similar ally. A heavy flamer with soul blaze. While Soul Blaze sounds fun (if a model suffers an unsaved wound, the squad stays on fire on a 4+ and takes D3 S4 AP5 (flamer) hits next turn), in reality what you are getting is a heavy flamer that can't be used in Overwatch, requires a psychic test and grants a Deny the Witch save. Guard get Heavy Flamers without those disadvantages on most vehicles for free, or pay 20pts to add one to many squads. As with Haemorrhage, I think GW over estimated the value of a power having potential to hurt more than once. The Primaris Psyker is a Lover not Fighter. Take the default power over this. One friendly unit has a 4+ cover save from shooting attacks except melta and soul blaze, plus any enemy charging suffers 2D6 S4 AP- hits at I10. The cover save and the average of 7 hits (not shots) to chargers are more beneficial to Guard than most armies due to our low armour and allergy to assaults. Combined with overwatch you may have a chance of wracking up enough casualties to actually stall an assault. This isn't a top-drawer power, but is worth keeping. Think of this as a 24" range frag-missile that fires as assault rather than heavy, ignores cover and might set things on fire. When you see it like that it is difficult to justify the cost of the psyker. Could be better than Flame Breath in some cases because of the range, so consider keeping it. The target model suffers a wound with no armour or cover saves allowed. If killed, center a blast marker over his and all other models sufer a S4 AP5 Ignore Cover hit. This is a good power because it causes a wound (not a hit, a wound) with no armour saves allowed, you get to pick the target on a LD check of 5 or less and it works at a reasonable range. The extra blast afterwards is just gravy, just don't expect it to do more than a mortar; ie very little. Short range attack that hits all enemy units in range with average 7 S4 AP5 (Bolter-style) shots that ignore cover, and blinds them. Any unit hit by a blind weapon must take an initiative test, if failed, all models are BS1 WS1 until the end of the next turn. It's a decent power, but what lets this down (for a primaris psyker) is the short range. This is probably worth keeping instead of default Flame Breath, which is also short-ranged. This is a melta weapon that works as a beam, meaning it can hit multiple targets in a 12' line, with the strength dropping by 1 for each target hit. Before you start to think how well this could combine with a melta squad, remember its Warp Charge 2 so you can't have it. Sorry. If you can take it through an ally, you’d still be giving up the casting of two powers for this one. Conclusion: Don’t roll on the Pyromancy Chart if you are Imperial Guard. The primaris power is too weak, the rest don’t offer enough reward to be worth the risk of a random roll. The majority of these powers can be obtained in the form of cheaper, more reliable weapon options on squads. This is a beam, meaning it can hit multiple targets in a 18' line, with the strength dropping by 1 for each target hit. It's easy to get excited beam weapons but the low strength and lack of AP value means you should think of this in the same class as a multilaser. Strikedown halves the initiative of a non-vehicle or MC model that is hit even if they pass a save and makes them move as if in difficult terrain, which adds some decent utility to the lacklustre shooting power. Target receives a hit with 2D6 Strength where 11 or 12 auto-wound or auto-pen vehicles, and AP D6. A decent shooting attack at a decent range, with average strength 7 and penetrating marine armour 50% of the time. Random strength and random AP make this a very random power. A 'Best of' utility spell, if you get this in an otherwise fairly static army it can be a game-changer. If you scatter and roll a double, one squad member is killed, which Guard care less about than almost any other army. It's worth considering melta/plasma stormtroopers with Aerial Assault for the re-roll of the deepstrike dice, but the best use might be to get a troop unit onto an objective. Enemy targetted must re-roll to hit and wound rolls of a six, making this more useful than ever in a game with snap shots and flyers. Vehicles are hit with a Strength 1 Haywire hit (glance on 2-5, Penetrate on a 6). If you roll this power, keep it. S3 AP- Assault D6, Pinning. It's like hitting with laspistols that cause pinning tests! 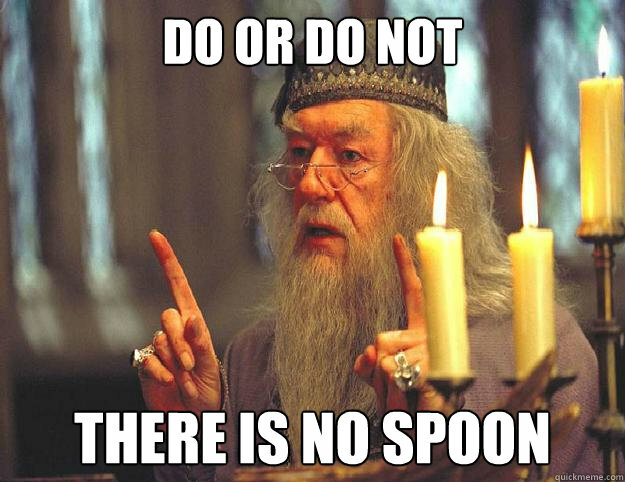 In other words, don't take it. The 5++ doesn't even work in combat so is just a fancy cover save, and the ability to deflect 33% of the shots sounds as Cinematic as Ninja-Jedi-Matrix but is only at very short range and unlikley to actually have much effect in a game. S10 AP1 Heavy 1 Blast, if the test is failed centre the marker on Psyker and don't roll to scatter. The strength and AP are the best available, and blasts are improved. On the downside, it's heavy and a blast so the psyker (and his squad) will have to stand still to use it, and can't assault after casting. Without relentless rules, you are relying on your opponent coming within 12' of you and pausing for a tea-break while you cast it. Don't worry though, it's also warp charge 2 so unavailable. Conclusion: Don’t roll on the Telekenis chart if you are Imperial Guard. Roll 3D6 and subtract the target's leadership, take a number of wounds equal to the result with no armour or cover saves allowed. This is an excellent shooting power, but when used by Guard it becomes potentially extremely powerful. Combined with Weaken Resolve you have a chance to absolutely gut a squad, since both are cast in the shooting phase so you can lower the enemy's leadership before wreaking havoc with this power. Lowering the opponent's leadership to 2 and then having them roll 3 dice can cause between 1 and 16 wounds with no armour saves! Then (as far as we know unless FAQed otherwise) still roll to hit with BS4. That is five potential points of failure, and that's four too many to consider this reliable. Still, sooner or later someone will kill 8 paladins with this in a single turn and the internet will go crazy. · If you must know, the first LD has a 5/6 chance to pass, DTW 5/6, Second LD 5/6, second DTW 5/6 = 48.2% chance for both powers, then BS4 shot hitting = 32% chance to get the combo off. If only the range was long enough to let you try it more than once before being slaughtered! The first thing you need to know is that this does not combine with Weaken Resolve. 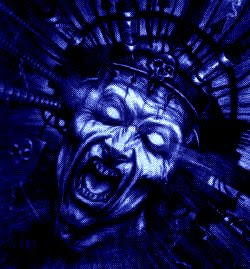 Maledictions are at the start of movement, WR is cast in shoot phase, and does not last into the opponent's turn. That said, even without that combo a unit that has to take up to three LD checks per turn has a good chance of failing something. One friendly unit that is falling back automatically regroups and gains the fearless special rule. It's good, but Guard have an order ‘Get Back in the Fight’ for this purpose, and squads regroup easier now regardless. It scores for long range, for giving you a chance to get a unit near the board edge to regroup before it has to move, and for the chance to keep a squad in assault during your turn so it can break in the opponent's turn. Note that if this power fails, you can still try to regroup with a leadership check as usual afterwards, and if that fails and the unit is still on the board you can do the GBATF order. If the unit fails after all three attempts to save them, you're better off without the worthless maggots anyway. You'll learn to hate it when it is used on your demolisher or vendetta, but this one is really worth taking. Keep in mind that it affects a single model, not a squad, and you only get to pick which model on a LD roll of 5 or lower - all that to say don't use it on the MEQ squad with one meltagun, use it on the Dreadnought. For more fun, use it enemy aircraft to skyfire against their allies or on a Manticore with limited ammunition. 24" Loses the Fearless Special rule if it has it, and treats all enemy units as having the Fear Special rule, and the target must make a morale check. With Terrify you can make a fearless squad vulnerable to leadership checks you cause by shooting or assault, and have to make an immediate morale check. The order of casting is important because the morale check it causes cannot be affected by Weaken Resolve, which is cast later, in the shoot phase. However because Terrify lasts until the end of the following turn it is a novel chance to make an otherwise fearless unit vulnerable to Weaken Resolve if you can force it to take a second leadership check later, usually due to shooting casualties. This would be fantastic on a large Blob Squad or similar unit, but at Warp Charge 2 it's too rich for your blood. 5-6 - Every model inflicts a single hit on his own unit, resolved at that model’s own strengths, but using the strength bonuses, AP values and special rules of their most powerful close combat weapons if they have any. IG Rating: 9/10 A great power, but again warp charge 2 so unavailable to the primaris psyker. Conclusion: If you are taking a Primaris Psyker in a Guard Army, this is usually the best chart to roll on. The default power is useful, and the fact that two of the powers are Warp Charge 2 and unavailable it increases the chances of getting Dominate or Puppet Master. Your mileage will vary, but I rate him as a moderately competitive HQ choice for Guard, compared to the extremely competitive Company Command Squad. The Primaris Psyker is not as versatile or capable of the damage output of a Company Command Squad, and I am not a fan of rolling on the random tables with a character who can’t make good use of so many of the powers on them. This applies to all Psykers from all Codexes: If the default primaris power is not extremely useful, you should probably be rolling on a different table. Anything else is gambling. When you are allying with Space Wolves. As Psykers go, the Primaris Psyker is completely outclassed by the Space Wolf Runepriest, a bloodbrother ally to the Imperial Guard. Coming with far more weapon and equipment options, better armour and toughness, excellent default powers and access to the divination table that Guard covet, the Runepriest is far better than the 30pt premium implies – and that’s before you add in the second best psychic defence in the game. If you aren’t allergic to allies and really want a Psyker, he’s your man. When you are allying with Eldar. Allying a Farseer for runes of warding is all the rage on the interwebs, but the rarely mentioned price is it shuts down all your own Psykers. No Primaris or PBS for you Xeno-Loving Scum! My conclusion was that the CCS remains so competitive it should be the first choice in most IG lists, with the Primaris as a contender for the second HQ slot. 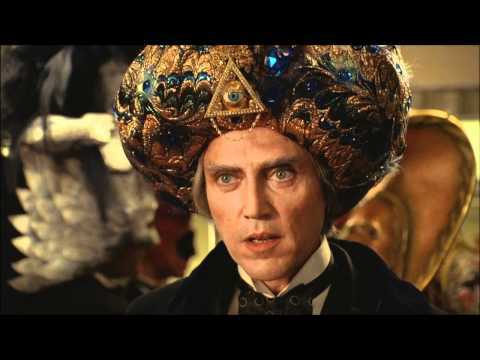 I'd personally have him roll on the Telepathy chart twice with the target power of Puppet Master. Not only does this have decent odds since there are only 4 powers available, but more importantly even if you don't get lucky all the other Telepathy powers are above average and the default power is good. If you want to keep it pure Guard and still want the excitement of rolling on the power tables, then the Primaris Psyker is your man.